Our integrated software solution in robobrain®.vision works with Artificial Intelligence (AI). The grasping points for workpieces are automatically determined – independent of their material and form. Random objects can therefore be processed without previous teaching; set-up times are practically reduced to zero when the products to be grasped are changed. And because every company has different processes, robobrain®.vision supports a wide range of parallel and vacuum grippers, for example OnRobot®, Robotiq® and Schmalz®. The robobrain®.vision system calculates optimal grasping points for a broad variety of overlapping objects with different surfaces and geometries – without having to scan or teach the objects in advance. Using robobrain®.vision thus enables the fast and effective automation of processes, for example in the logistics and metal industries. The system consists of a 3D vision camera, a powerful industrial processor and dedicated robobrain®.vision software solution. 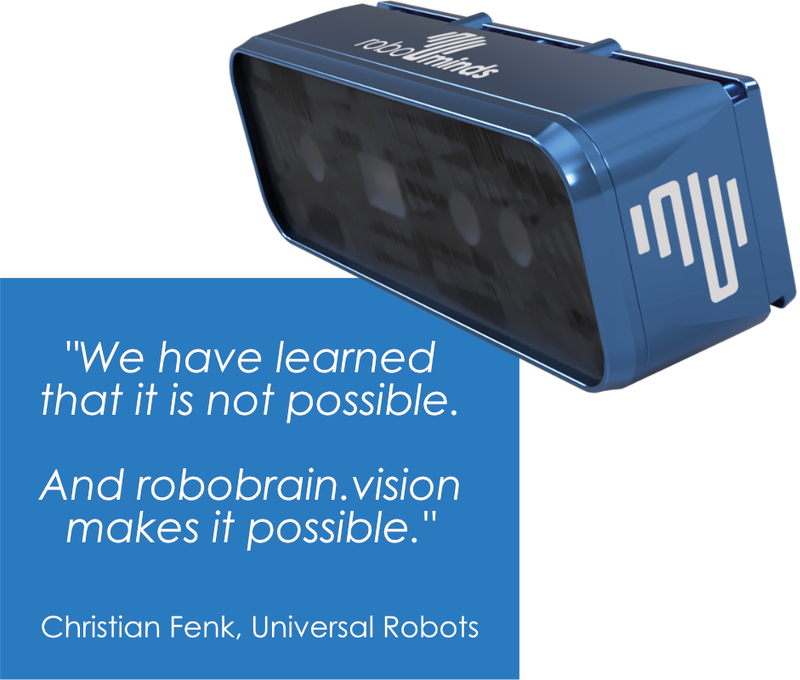 The intuitive user interface is a particular advantage of robobrain®.vision. The configuration is easy to manage in a web browser. Installation of additional software is not necessary. You will always work with the newest version of robobrain®.vision, thanks to regular and secure updates.